You sometimes get the best answers by throwing back questions to the people who asked them, and seeking the wisdom of crowds. So, Monday night, Edinburgh, and in the question and answer, a man asks me, having heard me on Brexit, Trump and much else besides, whether I see much hope on the political scene. So I throw it back. I ask for a show of hands: “Who feels optimistic about politics right now?” One solitary hand goes up. A gaggle of laughter at the table. It turns out the hand belongs to a Tory councillor, so perhaps he felt the need to stick up for his calling and for his leader, of whom I had not been entirely flattering. The next morning, speaking to a housing convention at Edinburgh’s International Conference Centre, my focus now the housing crisis and mental health, I get a questioner who has heard me say that I mark my own mental state daily on a scale of one to ten – one being deliriously happy, ten suicidal. My mental health campaigner hat makes me reluctant to use the language of mental illness in public debate. But I do believe Brexit, and the election of Trump, whatever the reasons behind them, many of which may be understandable, are acts of national madness. I do believe that they contain within them dangerous elements of self ­harm, and the ultimate self-harm is suicide. While there is a world – and on that climate change is a greater threat than Trump, though he adds to the threat – I am confident there will always be a Britain. But I am not at all confident in the Britain that Brexit is shaping. Assuming there are Leave campaigners who read The New European, on the basis that you should know your enemy, this may strike them as unduly pessimistic, given the great challenges we as a country have overcome in the past. Some may feel it is nothing short of unpatriotic even to suggest that we will not forge a great new future for ourselves outside the EU. To the charge of pessimism, I plead guilty, To the charge of lack of patriotism, I plead not guilty with multiple knobs on. It is one of the worst aspects of this debate going back for years that ‘pro-European’ should carry with it a sense of ‘anti-British’. My passion to halt the madness of Brexit comes not from a love of Europe, but a love of Britain, and a fear that we are opting for national economic, political and cultural decline in tearing ourselves out of an economic, political and cultural union that has served us and Europe well. To tell you about my mental health sliding scale, I am very rarely at one, and happily have only been a few times at the ten end of the scale. A good day is two to three. Bad days rarely get beyond six. I get the occasional eight, but it usually passes, and slips back down the scale, after a few days. The man in Edinburgh asked about the world, not Britain. But right now, I am more worried about Britain than the world. Trump will go. There will be mayhem en route. But he will go. The consequences of Brexit, if it happens, will be with us far, far longer. And that is why we must strive all we can to keep it as an ‘if,’ despite the overwhelming pressure, from government, opposition and most of the media, for it to be ‘when’. This is the thing that keeps me going. The pressures for ‘when not if’ are huge. But the desire for ‘if not when’ is stronger. If that was not the case, I would not keep meeting the people I do, day after day after day, expressing a mix of exasperation at what is going on, determination to keep fighting it, amid confusion about what that means in practise. Do you think Theresa May is a strong leader? Do you think she has a clear strategy for Brexit? Do you think she has a united team? Do you think David Davis is handling the Brexit negotiations well? Do you believe Liam Fox will deliver trade deals sufficient to fill the gap left by us leaving the single market? Do you think Boris Johnson is trustworthy? There are very good reasons why the momentum for IF is gaining ground against WHEN. We know a lot more than we did at the time of the referendum. Reality is exposing the lies and delusions peddled by Johnson and Co. The incompetent mess of the negotiations, and the inability of ministers to agree a strategy TWENTY BLOODY MONTHS after the referendum, is further undermining faith in their ability, and raising expectations of a bad deal amid the fear of the no deal feared by the many but wanted by the few on the hard right driving the government strategy. 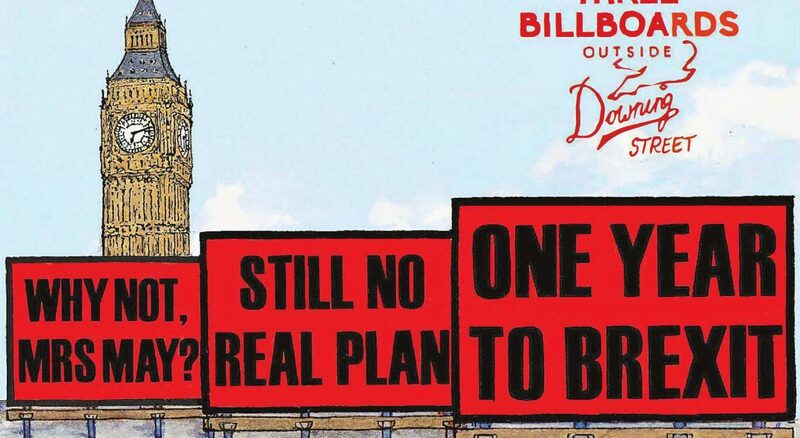 Twenty months, and still there is no real plan, no agreed strategy, no clear sense of direction, no clear destination in sight. What qualities has anyone seen in May and her hapless, hopeless, riven team that instils confidence that they will find in the year that remains the solutions to the problems they have failed over twenty months to answer? She began her Premiership, standing on the steps of Downing Street, seeking to project herself as the poster child for ‘Compassionate Conservatism.’ The chaos of Brexit soon put paid to that. Remember the ‘Just About Managing’ who were supposed to be the people who drove her politics? No? Nor does she. Right now, she is not just about managing anything. 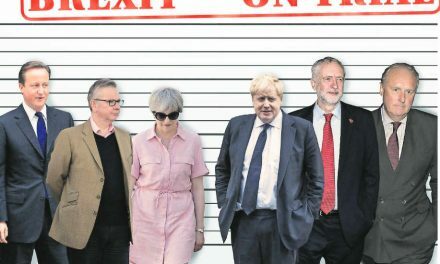 The road to Brexit is becoming pitted and potholed beyond repair, and the story of her Prime Ministerial career should be plastered on walls all along Downing Street, Three Billboards style. This is what gives me hope, keeps me going. They don’t have the answers to these questions they have struggled with for twenty months. As the clock ticks down, the reality becomes clearer. The lack of trust grows. The fear that we are sliding into something the majority – including of Leavers – never wanted grows with it. And so provided fatalism is defeated, people reach the view that they are simply not prepared to put such huge decisions in the hands of such huge incompetents. The demand for a say on whatever deal they come back with will have to be met. And when it is, anything can happen. I am confident people will choose a very different path to the one being pursued now. We have to keep fighting for that path to open. I hope you are right and eventually sense will prevail. I am concerned, however, as to the future of the Labour Party. Can it survive? Will Corbyn be able to fend of the hard left from taking over?